The Southern Pacific RR Roundhouse. —. This property was the site for two locomotive roundhouses constructed by the Southern Pacific Railroad. The first stood between 1911 and 1925, when the June 25, 1929, earthquake severely damaged it. Miss Pearl Chase, of the Plans and Planting Committee, Community Arts Association, convinced the railroad to design the new building in the Spanish style for which Santa Barbara was becoming famous. The beautiful result resembled the bullring in Seville, Spain. This property was the site for two locomotive roundhouses constructed by the Southern Pacific Railroad. The first stood between 1911 and 1925, when the June 25, 1929, earthquake severely damaged it. Miss Pearl Chase, of the Plans and Planting Committee, Community Arts Association, convinced the railroad to design the new building in the Spanish style for which Santa Barbara was becoming famous. The beautiful result resembled the bullring in Seville, Spain. From 1926 to 1961 the roundhouse and engine turntable serviced the Southern Pacific's steam locomotives; by 1961 the Coast Route had converted to diesel power. The structure was then remodeled for warehouse use and the turntable was removed. 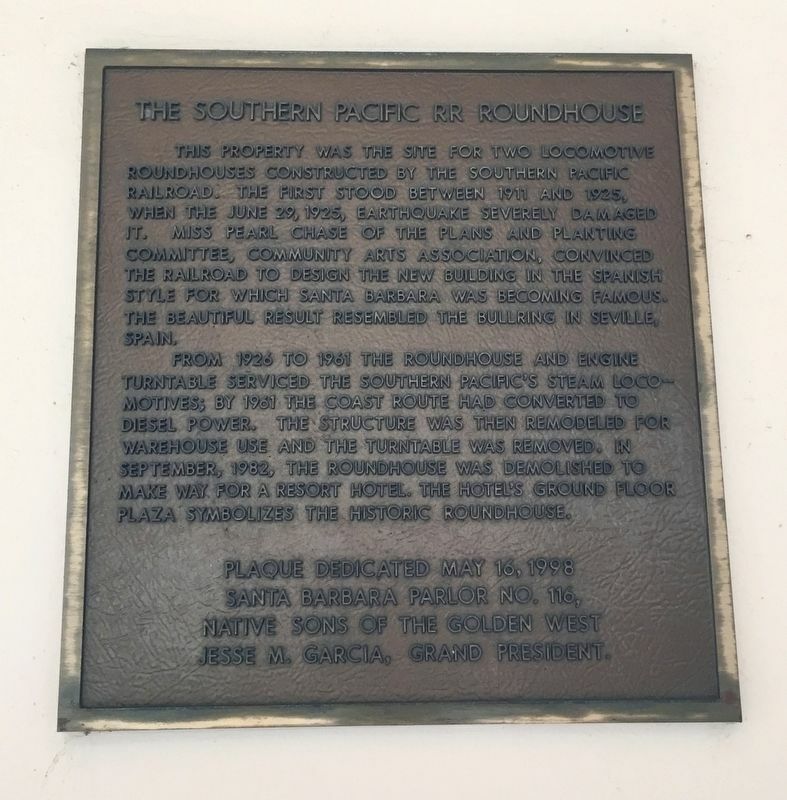 In September, 1982, the roundhouse was demolished to make way for a resort hotel. The hotel's ground floor plaza symbolizes the historic roundhouse. Erected 1998 by Native Sons of the Golden West Santa Barbara Parlor No. 116. Location. 34° 25.005′ N, 119° 40.569′ W. Marker is in Santa Barbara, California, in Santa Barbara County. Marker can be reached from East Cabrillo Boulevard west of South Milpa Street. Touch for map. Marker is at or near this postal address: 633 E Cabrillo Boulevard, Santa Barbara CA 93103, United States of America. Touch for directions. Other nearby markers. At least 8 other markers are within 2 miles of this marker, measured as the crow flies. 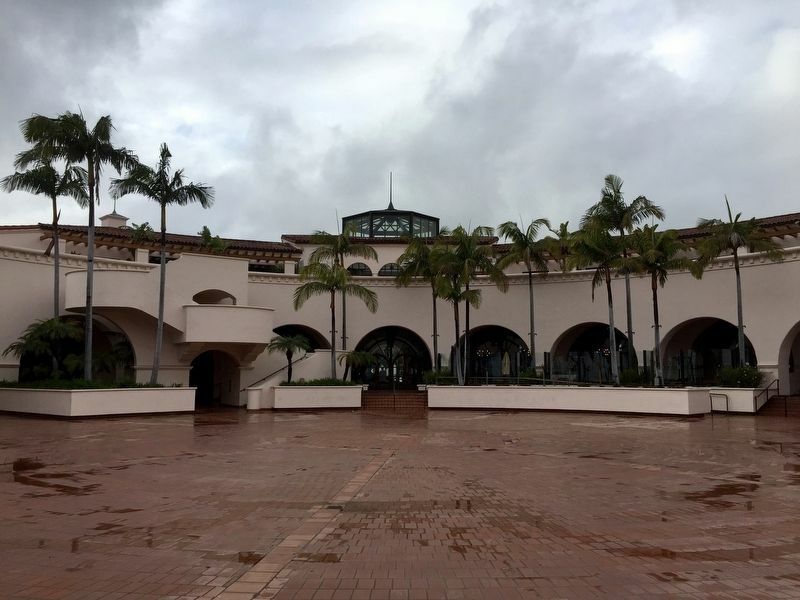 Santa Barbara Veterans' Memorial Building (approx. 0.9 miles away); Burton Mound (approx. one mile away); Sambo's Birthplace (approx. one mile away); Moreton Bay Fig Tree (approx. one mile away); Hotel Virginia (approx. 1.1 miles away); Casa Covarrubas (approx. 1.2 miles away); Santa Barbara Presidio (approx. 1.3 miles away); The Rochin Adobe (approx. 1.3 miles away). Touch for a list and map of all markers in Santa Barbara. More about this marker. 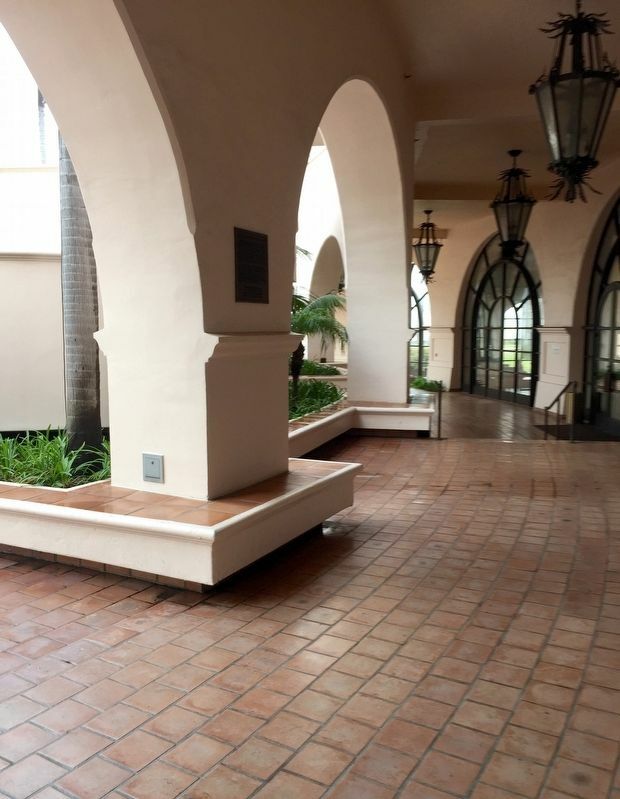 The marker is located to the right of the doorway (west entrance) of the Hilton Santa Barbara Beachfront Resort, mounted on the exterior wall, and best seen with one's back to the entrance (i.e. looking out into the courtyard). More. 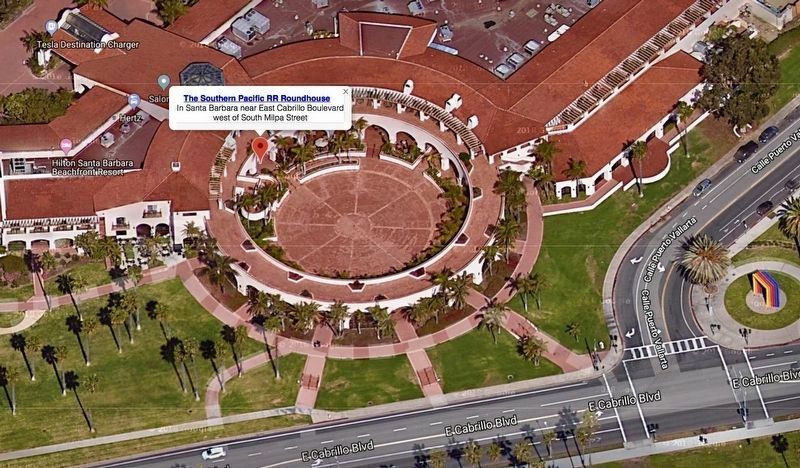 Search the internet for The Southern Pacific RR Roundhouse. Credits. This page was last revised on March 6, 2019. This page originally submitted on March 6, 2019, by Andrew Ruppenstein of Sacramento, California. This page has been viewed 52 times since then. Photos: 1, 2, 3, 4. submitted on March 6, 2019, by Andrew Ruppenstein of Sacramento, California.